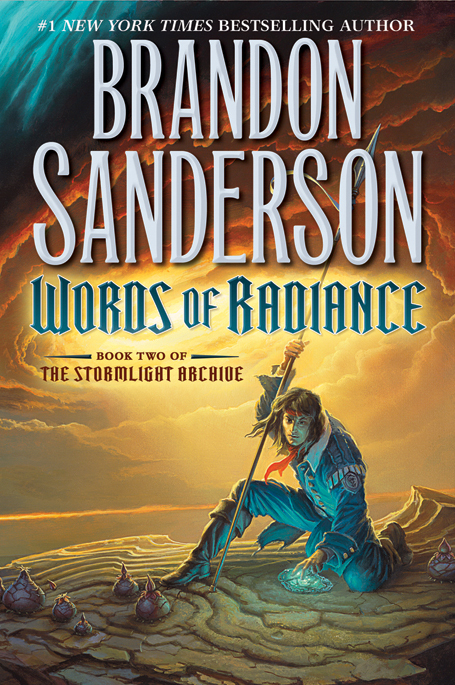 The US cover of Words of Radiance. This one's been a while coming! But it's time to finally conjure up some thoughts beyond "SHALLAN BOOK YAY". For those who haven't read the first in the series, The Way of Kings, Shallan is the ward and pupil of Jasnah Kholin - a member of the Alethi royal family. Shallan's plotline in the first involved deceit, a great deal of scholarship, and some wonderful drawings of the local flora and fauna (included in the book) - a far more complex character than she at first seemed, she's also by far my favourite of the series. (Plus, libraries. What can I say? It's Lirael all over again). In the planned ten book Stormlight Archive series, Sanderson is giving each book a character focus, with a set of dedicated flashback chapters. For Words of Radiance, these are Shallan's, explaining my initial reaction. But there's a lot more to the book than that, so let's get started. A word of warning, however: as WoR is a direct sequel to The Way of Kings, there will be unavoidable spoilers for the previous book. Words of Radiance continues from the climactic final act of WoK, in which Sanderson set a number of new plots in motion - Szeth (the Assassin in White) has been sent to kill Dalinar Kholin, Jasnah and Shallan have resumed their tuition arrangement - now with strange powers included, and the theory that the Parshmen race used as cheap labour are in fact the legendary Voidbringers - and Kaladin and his bridgemen have been recruited as Dalinar's personal guard. And from the beginning, it's apparent that everyone is converging on the Shattered Plains. Kaladin, despite being grateful to Dalinar, struggles with both his new status and his distrust of the higher caste lighteyes. Shallan, meanwhile, travels to the Plains - having to rely on her own wits, newfound but largely unknown powers, and her ability to act in a politically hostile situation. A marriage to a certain lighteyes would save her family's failing fortunes, but she has her own goals to consider, and Jasnah's as well. All the while, Dalinar pushes for an attack to end the war, rather than stalemate. And we even get a new semi-main viewpoint, on the Parshendi side of the conflict. So let's talk characters. Shallan is the big one: do her flashbacks live up to the 'promises' made by the reveals of her secrets in book one? It's an unequivocal yes, and they add a great deal of complexity - and ambiguity - to her character. It's also worth noting that she's a particularly awesome female character, in my mind, simply because she isn't forced into becoming the two dimensional 'action girl': her strengths lie in other areas, and she's allowed to use them. I particularly liked her interactions with Pattern, a spren scholar bonded to her. Kaladin's plotline suffers from a sense of repetition from Way of Kings, however, and it's hard to avoid a sense that he's mentally stuck in one place simply because the plot wouldn't function if he had certain realisations earlier. In other words, it's not a bad conflict, just an overly slow one. Szeth is similar, but expectedly so, and he definitely gets enough amazing scenes to compensate. Dalinar, meanwhile, compensates. After struggling to accept his visions for much of book one, he finally pushes ahead with everything in book two, and it's a wonderful read. as tWoK cover, but I love the style. Because of certain slow plotlines, Words of Radiance does get bogged down a little in the middle. While it's generally a great read, I can't help the feeling that a little editing to reduce the feeling of artificial character development slowness would be a good thing. That said, structurally, the first and last thirds fly by, and the interludes give much needed breaks - and wonderful Cosmere hints. 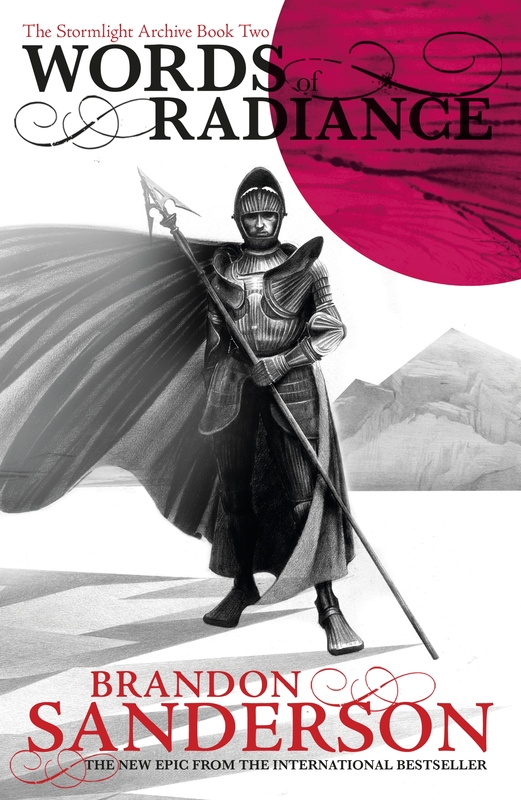 The Cosmere is the universe in which a number of Sanderson's novels are set, each tying subtly into some overarching story which will eventually become apparent. The main crossover so far is a worldhopping character named Hoid (who, yes, I also love. A lot.) - but in Stormlight Archive, these have become exponentially more common and plot-relevant. So much so in fact, that I would recommend reading WoR after at least Warbreaker and probably Mistborn to get the most out. I'm a big fan of shared universes, and it's a nice feeling to ferret out these nuggets of information about the overarching tale and universe. It's an exciting concept, and one I hope I get to see more authors eventually attempt. The ending makes up for a great deal of the novel's slowness, however. Without spoilers, it's clear that the Shattered Plains as a main setting are done, leaving me excited for the more open setting of Book Three. Further, it's just a more conclusive ending as a whole than Way of Kings, whose final act seemed largely to set up more plot hooks. That said, I'm hoping future books take us away from the entirely Alethi focus, and from Kaladin's bridge crews, I'm hopeful: we've seen a range of Roshar's cultures there, and so the prospect of escaping the Alethi/Dalinar's-family-centric view seems likely. Diversity wise, however, it struggles along with all of Sanderson's work so far in heteronormativity - though there is one minor character, all of the relationships so far are heterosexual. That said, it does definitely improve on the "one exceptional woman" trope which has occasionally tripped up Sanderson's characters before: while Shallan does end up isolated for a fair section, the series also has one of her most important relationships as the pupil/teacher one between her and Jasnah, who is an equally great character. Words of Radiance as a whole is definitely a worthy successor to Way of Kings, rounding off the series' first main arc. Where the first novel served largely as an elongated introduction - fantastic if you love worldbuilding, but perhaps not worth an immediate purchase if you're going to be wanting conclusions to all the plot hooks set up, the two taken together are a great read. WoR has its flaws, getting bogged down in the middle section and a repetitive Kaladin plotline among them, but overall is a fun read - and if largely for Shallan's sections, the interludes, and as always, the wonderfully inspired worldbuilding, I personally loved the majority of it.